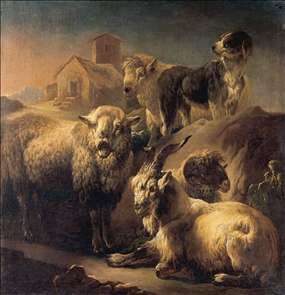 When Jesus was with the crowd, He told them a parable about the sheep and goats. Jesus said, “In the end times, God will sit on His throne with all His glory and judge the people. Everyone will stand before God, and He will judge them one by one. God will separate the sheep to His right side and the goats to His left side. Then Son of Man will says to those on His right side, ‘Come, you who are being blessed. You give me water to drink when I am thirsty. You give me food to eat when I am hungry. When I was ill, you care for me by paying me a visit. When I have no clothes to wear, you give me a clothes to put on. Then He will say to those on His left side, ‘Go away from Me! When I was hungry, you didn’t give me any food to eat. When I was thirsty, you didn’t give me any water to drink. When I am naked and have no clothes to wear, you didn’t give me clothes to put on. When I was at the prison, you didn’t pay me a visit.